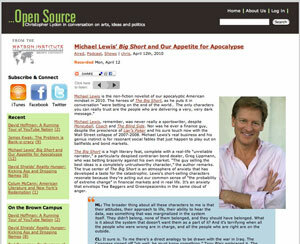 If you'd like to hear an overview of what's in Michael Lewis' book "The Big Short" (see my blog entry about this book), then I recommend you listen to this interview of Lewis. [RadioOpenSource Interview of Michael Lewis] It was recorded on April 12, and is pretty interesting. It lasts 43 minutes. And if you find that interesting, then you might enjoy their interview 2 days later (April 14) of James Kwak, co-author of "13 Bankers" (see my blog entry about this book). [RadioOpenSource Interview of James Kwak] It lasts 41 minutes.